The game involves attending Hogwarts six years before Harry Potter steps foot in the castle, but after his first encounter with He Who Must Not Be Named. You play as a student whose brother was recently expelled for breaking school rules on his quest regarding the cursed vaults. He went missing shortly after. Now, as a student yourself, you make friends and follow his footsteps in the hopes that solving the mystery of the cursed vaults will solve his mysterious disappearance. On the way, you make friends and enemies. One enemy is Merula Snyde of Slytherin. She believes she is the most powerful witch in the school and is hungry for attention. She is ready to sabotage and duel her way to the top, regardless of what house you are in, even if it is her own. Some of your friends include two of the Weasley brothers, Bill and Charlie, as well as Tonks and some new characters. The need to acquire energy points is annoying; but if you have the patience, it’s a great game. You can spend gems (which you can earn some of through game play or by spending real money) to buy energy, wait for energy to accumulate, or acquire free energy. There are one to two places on each floor where you can obtain free energy every few hours if you know where to tap. The one example of this is a stick on the castle ground that can tapped on to attract Hagrid's boarhound, Fang, who will fetch the stick and provide the player with one free energy point. 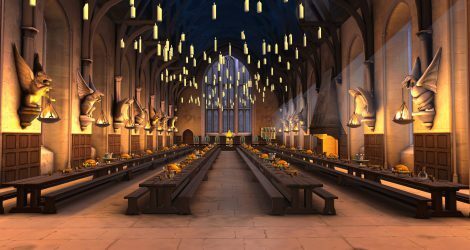 Other ways to obtain energy are leveling up friendships through having a meal in the great hall, playing Gobstones in the courtyard, or, in later years, sharing a drink of butter beer in The Three Broomsticks tavern. Another great feature of the game is side quests. I hope to see them developed more in the future because they really add to the game play. Side quests are optional and fun. A side quest could be helping a teacher, helping Madame Pomfrey in the hospital wing, or helping out a friend. You earn knowledge, courage, and empathy points throughout the game. These help to level up those traits, which can give you bonus points in activities or unlock special choices throughout the game. Harry Potter fans will love the way this game brings Hogwarts to life with great graphics and complex gameplay, while staying true to J.K. Rowling's Harry Potter universe. However, if you don't have the patience to acquire energy points the cost-free way, the game can get expensive.